An unrecognized mark on the radar was detected nearby the coast. Two fighters Mig-21 was sent to intercept the unknown aircraft. Pilot Andy controlled second Mig-21. The illegal infiltrator was shot down by first Mig-21*. Both Mig21 returned to the base. Andy and I tested an approaching control system. In the picture below it is represented how an approach looks like. LotATC DCS can be used as an advanced tool for a controller in DCS. A controller can help to land in limited visibility (night, weather etc). 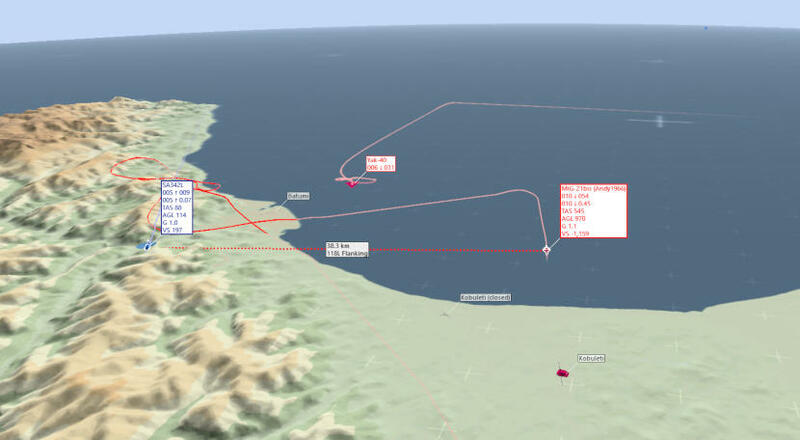 As well as a controller can monitoring flights in to special areas as polygons, pilotage areas etc (a zone can be added on the controller map). Mig-21 is landing with control glide path by an approach controller. A frontier intruder was detected on the radar. We tried to contact the intruder by the radio but without any success. Mig-21 was scrambled for the interception. Our Mig-21 passed closely the intruder. Andy (pilot of Mig-21) recognized the intruder as C-130 Aircraft. C-130 didn’t react to the presence of Mig-21. It was an attempt to show that the C-130 must follow Mig-21 – no success. Mig-21 demonstrated its weapons – no success. The target was shot down by pilot Andy by the order. The target crashed into the Black Sea. 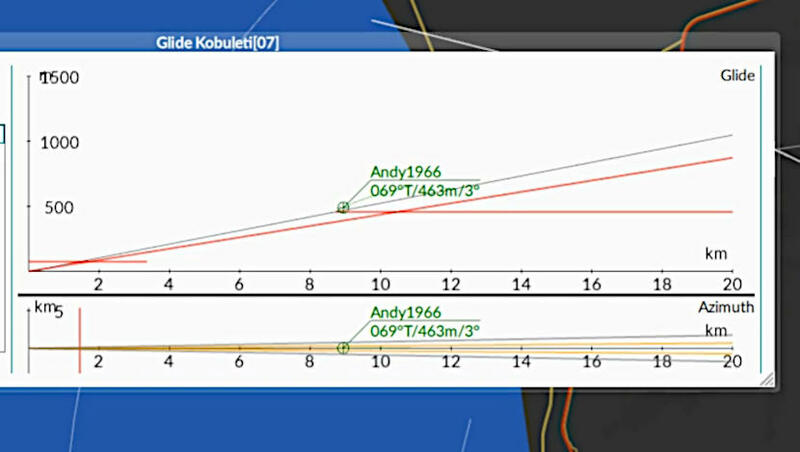 Pilot Andy several times passed an unknown plane according orders. 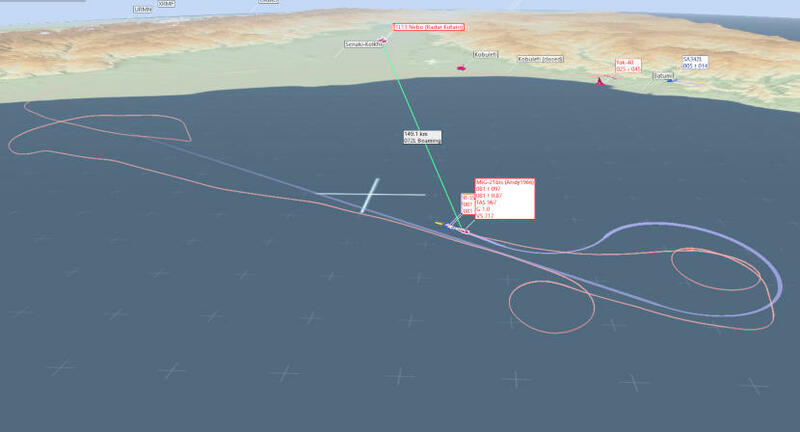 A low-speed and manoeuvrable target was detected on the radar. The target was on low altitude. A Mig-21scrambled to intercept the target. Later the goal was identified as a helicopter. 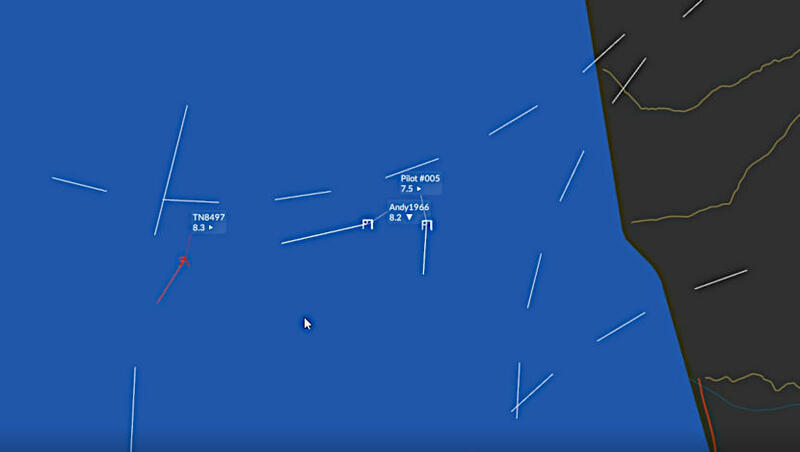 The intruder used terrain to hide from radar. Target’s mark appeared and disappeared on the radar*** That made the interception very complicate. The intruder follows terrain to be hidden. The intercept wasт’t successful. Mig-21 had to return the base due to lack of fuel. An attempt to intercept a low-speed, maneuvrible target on low altitude in mountains by Mig-21. 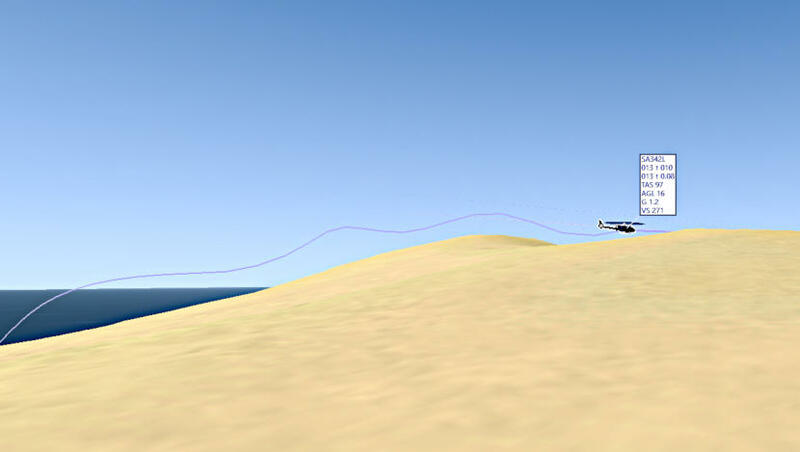 Another low-speed and maneuvrable target was detected which crossed the border. 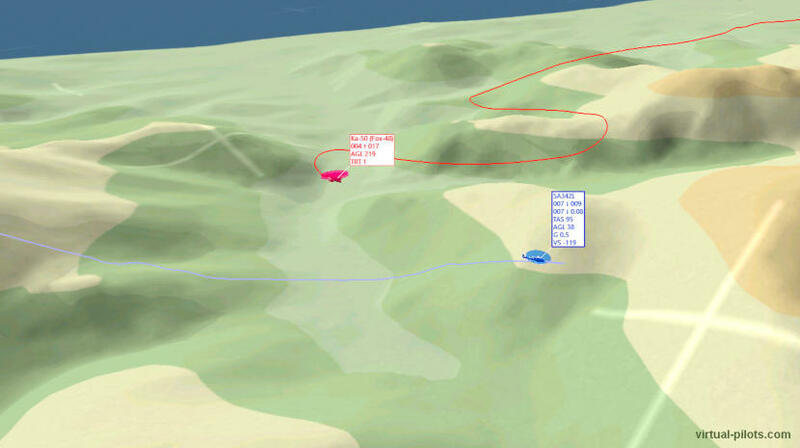 To intercept target, two Ka-50 were scrambled (pilots: Fox and Andy). Ka-50s were vectored by a GCI operator Alex. In the mountains the target constantly appeared/disappeared from the radar. After while the target didn’t appear on the radar. Both Ka-50s returned to the base. Unknown helicopter type “Gazelle” before its crash. In the mountains the radar has limited ability. Ka-50 searches visually the targets between mountains, another Ka-50 searches in another area. In short: a mark was found on the radar. Later it was recognized as two helicopters type “Gazelle”. The first enemy helicopter was hit by and ditched. Both Gazelle pilots were captured by ground forces. The second enemy helicopter followed its heading and was shot down by pilot Fox. The crash site was investigated by a special group which was delivered by Mi-8 (pilot Andy). The investigation group found the wreckage of the enemy Gazelle and two bodies of its crew. The fifth flight was very interesting – the video is HERE! ** Server LotATC DCS has a lot of settings. 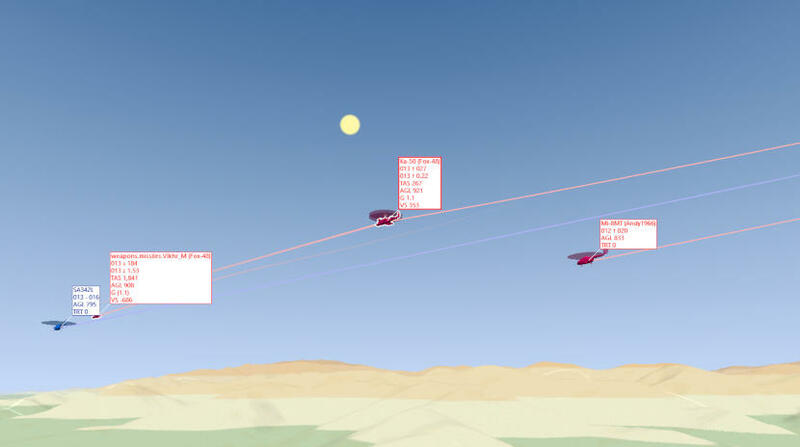 But even in the base level you cannot see a type of enemy aircraft (like in reality). *** LotATC respects the physic of radiowaves, i.e. it simulates normal radar work. In reality a radar cannot detect a target behind huge obstacles as mountains. **** In LotATC an operator doesn’t know does a target alive or not. He just can see a target if it will appear on radar. I intentionally didn’t how LotATC works in details. It is a big topic. This article shows how we can make a serious event from a simple mission. The flight day was really nice! Despite missions were super simple, the atmosphere was very exciting. Missions were really simple – it was made during ~10 min (just several pairs of Mig-21, Ka-50, Mi-8 were added on the map and two groups of enemies). IT WILL BE ENOUGH WORK FOR EVERYONE! The secret is that when we hide all objects on the map (F10 view) + AWACS doesn’t non-stop chatting… In such environment for a player exist only that target that he was informed by an operator or by other players. Consequently, this environment forces to players to commmunicate with each other! 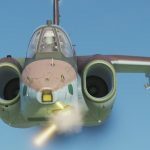 Mig-21 hot dogfight – just nice video with music. Enjoy! Да. было интересно! Еще бы попробовать что-нибудь сообразить с наземным целеуказанием. Например для самолетов СУ-25Т есть возможность подсвечивать цели с земли, с помощью модуля Combined Arms. It was interesting! It would be great to try something with a target destination. 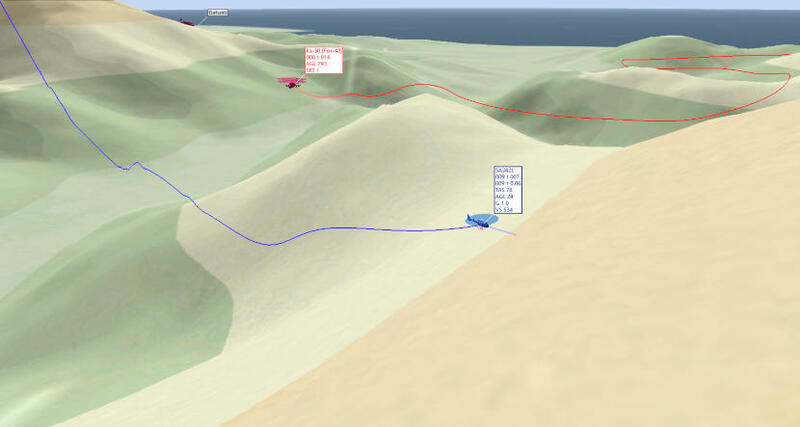 For example, with Su-25T we can use a target destination from Combined Arms. Yes, it is a good idea. At least we can try to use smokes from Combined Arms as the target destination. I can be a controller and a forward observer – to show ground targets. Additionally, I would like to mention that nobody (during two days of my hosting) didn’t complain about freezing. Isn’t it? Did you experience freezes? Да, это хорошая идея. По крайней мере мы можем начать с использования дымов в Combined Arms как целеуказание. Я могу быть и диспетчером и передовым наводчиком. Я хотел бы отметить, что за время моего хостинга никто не жаловался на фризы. Были ли фризы?